I always love to learn something new, and this was no exception. I have seen half square triangle quilts all over the webosphere, but I hadn't attempted one of my own. 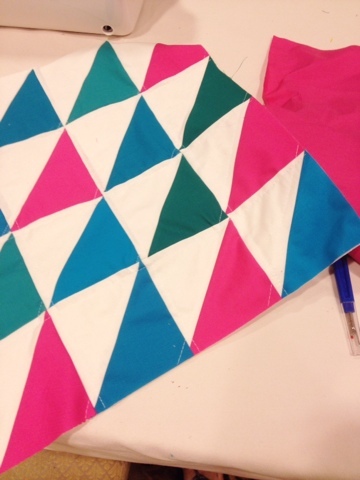 I was able to complete this Half Square Triangle Pillow with the help of +Amy Smart! 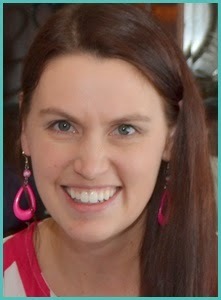 A couple weeks ago I attended +Tauni Everett Event for bloggers called Snap! It was held in SLC. At the conference they had a sewing room. It was Awe-Some! I pretty much hung out there the whole time. Mingling with fellow sewers, sewing away on +Baby Lock sewing machines. We took 8 charms from a Kona solid fabric stack. Each stack only has 1 of each color so I bartered and traded until I had enough of the pink and turquoise bluish fabrics. Then you will also need 8 solid white 5" squares. Stack 1 colored square on top of 1 white square, with right sides together. Sew down each square 1/4" away from the line that you just marked, on both sides of the mark. Figure out the layout you would like with all the squares. For the back you will need 1 fat quarter. You can finish the pillow however you would like. I finished mine with an envelop back because that is what is easiest for me. Plus when I need to wash the cover then I can just pull the pillow out and give it a quick wash. Cute pillow! I really like those colors! Cute pattern and I love the pillow :) Thanks for sharing on Something To Talk About link party! Hope to see you again next Monday!